By Peter Reaburn, et al. If you are studying exercise and sports science, or a related course, then this book will be an indispensable companion throughout your entire degree programme. This ‘one-stop’ text will guide you through the wide range of practical, analytical and data handling skills that you will need during your undergraduate and/or postgraduate studies. It will also give you a solid grounding in the wider transferable skills such as teamwork, using information technology, communicating information and study skills. 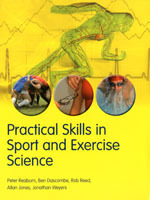 Practical Skills in Exercise and Sports Science provides an easy-to-read guide to help you develop the skills you need to succeed. It explains the essential elements of practical techniques and procedures in a step-by-step manner to help you understand their application in the context of exercise and sports science. This text’s unique and comprehensive coverage includes: general advice on practical work; measuring techniques; field tests; statistical techniques; analysis and presentation of data; and study skills.